HTTPS usage on the web has taken off mainly due to Google and their Chrome web browser. HTTPS has now become a requirement for many new browser features, and Chrome is dedicated to making it as easy as possible to set up HTTPS. Let’s take a look at how. Chrome’s move was mostly brought on by increased HTTPS adoption. Eighty-one of the top 100 sites on the web default to HTTPS, and the majority of Chrome traffic is already encrypted. What’s the difference between HTTP and HTTPS? With HTTP, information you type into a website is transmitted to the site’s owner with almost zero protection along the journey. Essentially, HTTP can establish basic web connections, but not much else. When security is a must, HTTPS sends and receives encrypted internet data. This means that it uses a mathematical algorithm to make data unreadable to unauthorized parties. HTTPS encryption protects the channel between your browser and the website you’re visiting, ensuring no one can tamper with the traffic or spy on what you’re doing. Without encryption, someone with access to your router or internet service provider(ISP) could intercept (or hack) information sent to websites or inject malware into otherwise legitimate pages. HTTPS prevents intruders from eavesdropping on communications between websites and their visitors. One common misconception about HTTPS is that only websites that handle sensitive communications need it. In reality, every unprotected HTTP request can reveal information about the behaviors and identities of users. HTTPS has become much easier to implement thanks to services that automate the conversion process, such as Let’s Encrypt and Google’s Lighthouse program. These tools make it easier for website owners to adopt HTTPS. 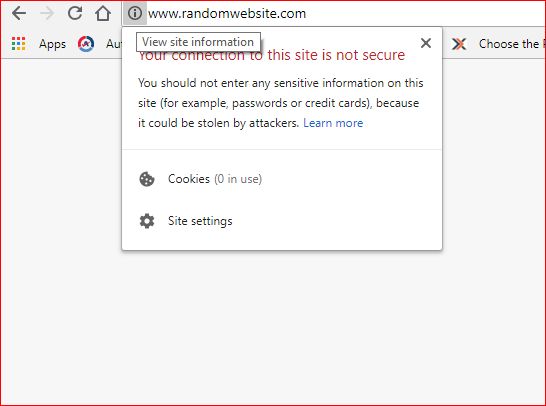 Chrome’s new notifications will help users understand that HTTP sites are less secure, and move the web toward a secure HTTPS web by default. HTTPS is easier to adopt than ever before, and it unlocks both performance improvements and powerful new features that aren’t possible with HTTP. How can small-business owners implement and take advantage of this new interface? Call today for a quick chat with one of our experts to get started. An MSP IT services leadership veteran with over 20 years of managed IT service provider experience. Richard together with his skilled team have literally a lifetime of experience at providing and growing new technology service offerings at his managed IT Services company, Delaney Computer Services, Inc., which is one of New York's Premier Managed IT Services companies. Richard's company is headquartered out of Mahwah, NJ with offices locations in Midtown Manhattan and South Florida. Richard is especially diligent with industry compliance and specialized in HIPAA Hi-Tech compliance as well as PCI and SAE16 and together with his team have been extremely resourceful and have the ability to simplify complex information and present to customers and stakeholders alike as well as a keen ability to provide truly proactive monitoring solutions so that IT solutions are supported properly after implementation. Richard is well versed in all areas of Information Technology with our company motto"Design, Secure, Build, Maintain" with a special emphasis on maintain we excel at service automation and predictive failure monitoring and proactiveness of solutions. "Plain and simple I am a problem solver and work hard to keep those problems from coming back".